There was a unique call in the NFL game this last Thursday night. The Philadelphia Eagles were on offense during the 4th quarter. 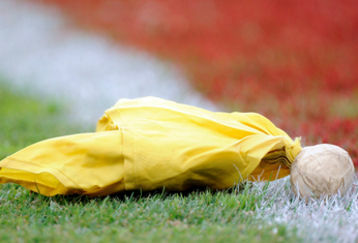 A flag was thrown for a false start. This is a call that usually indicates sloppy play on the part of one or two players of the offensive line. In this case the sole offender was the only one NOT flagged for the infraction. The center, Jason Kelce, forgot the snap count… and while everyone else sprung into motion… he never hiked the ball. Referee Walt Anderson received more than a few laughs for his announcement: “False start, everybody but the center.” The culprit was the only one not called for the penalty. Our verse today from Ecclesiastes reminds us that there is not a single person on this earth that is innocent before a holy God. Not even righteous people do good all the time… even they sin. Illegal motion could be called on just about every play that humans beings are a part of. Romans 5: 6-8 reminds us: 6 For while we were still helpless, at the right time Christ died for the ungodly. 7 For one will hardly die for a righteous man; though perhaps for the good man someone would dare even to die. 8 But God demonstrates His own love toward us, in that while we were yet sinners, Christ died for us. Solomon said there in not a righteous man who continually does good and does not sin…. but that was because he never met Jesus. Our redeemer, in the fullness of time, came to live the only sinless life that has ever been lived. Then, at the cross, where He died, He took the penalty for our sin. (2 Corinthians 5:21) In the game called life, He has given us the victory! And has made us penalty free in the process! Blessed be His holy name!